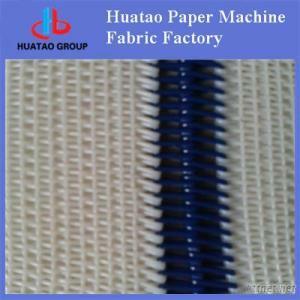 Polyester woven dryer fabric can be divided into 3-shed, 4-shed & 8-shed. Made from high grade flat monofilament and round monofilament polyester yarns. Used in the Drying section of paper Machine to product all kinds of papers. According to the weaving, polyester dryer fabric can be divided into 3-shed, 4-shed. According to the joining mode, it can be divided into insert, pin, pin ring and spiral ring join. 3-shed one layer and a half polyester dryer fabric suitable for drying papers below 70g. 4-shed double layer polyester dryer fabrics suitable for drying papers above 70g. Rectangular wire polyester dryer fabric is suitable for the fore several heating box of the drying zone, quality papers can use all.